I am happy to be participating in Multicultural Children’s Book Day! The Multicultural Children’s Book Day (MCCBD) team’s mission to spread the word and raise awareness about the importance of diversity in children’s literature. Our young readers need to see themselves within the pages of a book and experience other cultures, languages, traditions and religions within the pages of a book. We encourage readers, parents, teachers, caregivers and librarians to follow along the fun book reviews, author visits, event details, a multicultural children’s book linky and via our hashtag (#ReadYourWorld) on Twitter and other social media. My Book for MCCBD is Amazing Places poems selected by Lee Bennett Hopkins. In this collection of original poems, acclaimed anthologist Lee Bennett Hopkins brings together fourteen selections that celebrate through poetic imagery some of the amazingly diverse places in our nation. These include Denali National Park, the Oneida Nation Museum, San Francisco s Chinatown, the Grand Canyon, the Ringling Circus Museum, Harlem, the Liberty Bell, Fenway Park, and more. The poems as a whole take readers on an exciting multiethnic travelogue around the United States and encourage a positive appreciation of our country s historical, environmental, and cultural heritage. The inspiring and insightful poems were created by some of the best-known authors writing for children, including Alma Flor Ada, Jaime Adoff, Joseph Bruchac, Rebecca Kai Dotlich, Nikki Grimes, J. Patrick Lewis, Jane Medina, and Linda Sue Park. Captivating illustrations by award-winning illustrators Chris Soentpiet and Christy Hale feature well-researched settings that infuse the poems with vibrant life and atmosphere. BigG loves geography and interesting places. I knew this would be a fun read for him. The poems made it interesting to read. I like exposing him to poetry – although at this point we’ve really only read funny poems – so this was a great way to experience some quality writing. The book has some amazing artwork that illustrates the places in the poems. I would love to see a part two as this really only covers a small portion of the United States’ amazing places. G’s favorite was The Sandy Hook Lighthouse. It’s a shape poem – written in the shape of a lighthouse! And it has a very neat picture to go along with it. My favorite was Niagara. But it might be (again) because of the artwork. The back of the book features details on each place feature in a poem. That was helpful for answering G’s questions. This book can be read cover to cover or you can do one poem at a time and expand upon it with activities and if you live close enough to the place the poem is based upon – you can take a field trip! Since G’s favorite was the poem about the Sandy Hook Lighthouse we did lighthouse activities! He loves to draw so he made his own. Then he built (a rather good one!) our of LEGOs! I would love to take him to see it but I’m not sure I’m up for the 15 hour drive! Thanks for checking out my MCCBD review. Don’t forget to check out the hashtag #ReadYourWorld on social media to find more posts, reviews and books for this day! 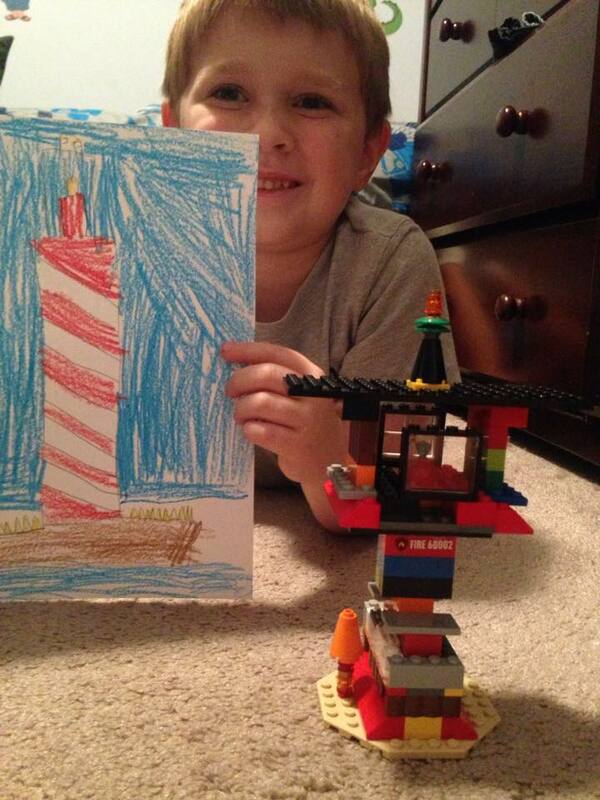 G’s artwork and lego replica are awesome! Thank you so much for your support of Multicultural Children’s Book Day and for your great post!!! What a great poetry anthology!